Ok, so I would have posted this under Baby Products but this article totally encapsulates my issues with a minivan. I drove the same wannabee extended stationwagon with the fake wood paneling in high school. But was great toting lots of folks to the beach. Right now I think I want one, but perhaps will consider when the prices are lower. Oh Sweet Minivan O Mine"
It hauls our junk to the recycling center. It hauls our big asses up and down the 101. It protects us again from bad car accident. J got into a card accident this morning. The tank got rear-ended on the 101 after a car had cutoff a car ahead of J. Which caused all cars to hit their brakes. Unfortunately the guy behind J was driving his pregnant wife to the doctor and just at the moment the cars ahead hit the brakes, the wife was having some pains that took the driver's attention away from the road. Thus, the tank getting rear-ended. J is ok and we're praying there are no side effects of whiplash etc. However I'd like to ask for prayers for the pregnant woman who was in the car that hit J. She was very rattled along with the driver. I can only imagine the fear of a terrible accident injuring the child. Once again our 1995 volvo wagon a little banged up but still holding up...we're considering getting another car since this wagon has been hit two times now. Who Had Too Much to Drink? I can't bare to say anything. The photos stand for themselves. After reading this article I felt like wow...we've been doing this for years. All of our cars except for the Honda was used. More recently J's skills with cars have become very good at reviewing used cars and knowing what parts will need to be replaced. We've been doing what the article suggests for a few years now and it definitely has saved us tons of money. What's funny is I start eyeing cars this year and plan for what it would cost in 5 years to get used! It follows some of the ideas I posted about before regarding self-control. I'm super upset. The guy who crashed into us totally lied to the insurance company and said it was our fault. If you did forensic analysis on our car it's so obvious to anybody who looked at it that it wasn't our fault. The angle of the impact and the ripple effect of the impact is clearly from the direction of the person who hit us. Now we have this major repair to do on the car since his car company won't pay for it. We're so convinced of Volvo's solid cars that we think we're going to sell the Civic and get either a sedan or another wagon. It turns out from the body work estimates that the damage is actually more than what we paid for the car or just slightly $100 less than what we paid for it. Now J is bummed we didn't get comprehensive so that the company would just give us the cost of the car. Oh well. We're praying that the other insurance company takes care of the body work since it was the other driver's fault even though he has no idea what happened. It's really strange driving around yesterday without the driver's side mirror. I had to keep looking over my shoulder. We didn't even have the car one week and we got into a bad car accident last night while we were driving back from J's family Christmas party down from SF at 12:20AM. It was raining hard last night and a minivan hydroplaned into us. I'm glad J wasn't driving fast. We're just glad we were in the Volvo wagon . If it were the Civic we would have easily spun out and slammed into the freeway wall. We lost the driver side mirror, and driver side door and the back door was dented pretty bad. We're both ok but we were shaken up last night really bad and probably didn't get much sleep. We couldn't last with just one car...but we lasted over a month. J's department just moved south and not closeby to caltrain. J just picked up a used 850 volvo wagon. It's in teal very 90s, but we got it well under our budget. We're pretty excited that we can haul our junk now...Summerwinds Nursery here I come!!!! So in the past 2 years we've owned about 6 or 7 different cars...and today we just sold the last of our miatas...we've regretted selling the yellow one after all the hassle and tender care needed for the black one. So we're down to our faithful Honda Civic which we've had for over 6 years. I think all these car swappings is a sign that we need to grow up a little and settle down with more family friendly/hauling type cars/wagons. Will keep you posted on what we decide. The list is as follows: Mazda 5, Volvo V70R, Honda Element, Subaru Outback or Toyota or Honda's minivan. One alternative is to do autocross. Many of the race clubs offer this more low key version of racing your car. I did it once a few years ago and did really well. PCA hosts many of these. I think the best is to find women run track events. There's a different style of teaching and interaction that doesn't involve a bunch of guys scratching themselves or spitting or telling really profane jokes. Another alternative is to do go-karts. They are much smaller really fast vehicles but it's usually in an open cart, around fairly complicated race tracks, and you're closer to the ground. 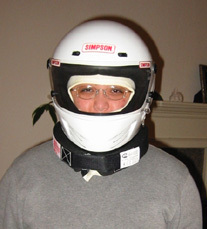 Two in our area are quite fun, Go-Kart Racer in Burlingame and Speed Ring in Santa Clara. Malibu Grand Prix is ok but you're on your own on the track. The other two are wheel to wheel racing. Never got the chance to do another tracke event and will probably have to wait a while again for that itch to get a racing type car. I miss my 94 gold camry. I guess there were many made for that year because I see many of them in and around where I live. It's funny because it's been a year since I sold mine. It went to a neighbor around the corner but when we came back from HK they didn't have it anymore. I used to like seeing it parked out in front of their house. I wish I told them if they decide to sell it that I would take it back, but they probably sold it while we were gone. So when I see a 94 camry in the same color I try to see if it is the same license plate. Now I just wonder if I should go on the waiting list for the hybrid camry. They look really nice but the price is just so out there. Or perhaps I just give in and get a used 94 camry. I miss the capacity of hauling. The Civic is not anywhere close to the same capacity. Oh well just move forward and continue my research for V70Rs, Siennas, or Odysseys. Ever since Jeff got his black suped up miata, he hasn't really taken an interest in doing any more mods on mine. Also with me running around doing errands the 2 seater wasn't practical so I was using the Civic more often. I figured in the end we really didn't need 3 cars. So I've decided to sell the miata and at some point we'll sell the Civic as well so that I can have a more family friendly wagon. I stumbled upon a corral of antique mustangs at De Anza College last Saturday. I was on campus for an all day workshop on writing and publishing picturebooks but this auto show was just amazing. Restored show cars and muscle cars reving engines throughout the day was a great surprise. I walked around for 30 minutes before class began and snapped some shots. Speaking of 'stangs...I really like the new ones. It has lines closer to the design of the original. Speaking of design...the 2006 Eclipse is pretty hot! I noticed the lines are much closer to the mid 90's body which I believe is more in line with the "eclipse" look. So for either one, I'm not ready to plunk down $30K but it's great to see the evolution of the design of these cars. I heard as well that the new Porsche designs are more in line with the 993s than from the 996 which is a big relief for many porsche purists. I was actually doing a line of sketches a few years ago documenting the profiles of the 356, 993, and 996. I felt like the 996 deviated. Smehow I really like the progression of the cars from 356-993 except however the 914 which was all in its own world (with its own cult following). I was just at the PCA website and they are celebrating "50 Years of Fellowship." I've never seen the word "fellowship" used outside the context of organized spirituality. I guess for most folks PCA IS their religion! Either way, it's great to hear these types of milestones. I really enjoyed the local PCA crew. I had my first experiences with auto-cross and joining a morning drive where I almost threw up inside our 993 turbo...yes very fond memories! Alas, no more porsches in our stable...a nice and reliable civic, bumble bee miatas(1 yellow, 1 black)...a nice group, but at some point we'll probably give into the wagon or minivan crowd as we start to have kids. Looks like in the 4th position we have a woman racing at the Indy 500. Very exciting and hopefully I will get a chance to watch the start before service. I can imagine this being really challenging for those manly men who get beat out by Danica. Imagine at the end of the race, "You got beat by a girl!" But then again maybe the sponsors and advertisers would love it since they can increase sales to a more diversified group of viewers? So just sold the BMW on Thursday just a few hours before I boarded a plane for IL. It was such a stressful day since I just wanted to sell the car and not stress this coming week of showing and negotiating. The car has a new home now in Pleasanton. I hope the new owners enjoy it as much as I have these past 6 months. Not only have we sold my Camry, we've sold the Porsche to a really nice guy in Half Moon Bay. While Jeff was reliving his experiences of racing, I reminded him that many of the people he has met through Rennlist & track events were such a nice tight bunch and I wouldn't be surprised if we end up crossing paths again with them again. We took our last photo with the Porsche on Saturday in front of the new owner's house. This weekend was my first full-fledged experience of driving on a track. April 17th found me on the Buttonwillow Raceway organized by Tracquest. Just me...my car...and the track(of course with a driving instructor). Not auto-cross this time...it's the whole day of running the track at Buttonwillow Raceway with Tracquest. When we first started dating way back when, Jeff and I went to the annual car show(LA, SF, Detroit) to check out the classic, latest high-end sport cars and luxury sedans. We always had fun and even then we were really into cars. When I lived in IL I even took advantage of driving parts of Route 66. My best friend lived in a small town, Edwardsville, IL where they have a whole weekend of festivities around classic cars and Route 66. So many years later and after drooling/enduring the many car shows and sitting in the 2 convertibles that I really...really liked...I got one. I got my very own BMW 330ci Convertible in steel blue. Dreaming of my next next vacation is going to marry the best of both my favorite worlds: Day Spas & Race Car Driving. Attention, thrill seekers. Live your Paul Newman fantasy, the one about car racing, not making salad dressing, at Panoz Racing School. Licensed drivers who qualify after an intensive drill on a practice course are suited and booted, then get in a GT-RA (the new spec-GT race car) and zoom around a 2.5-mile Grand Prix track, with elevations, 90-degree turns, and blind corners, at up to 150 mph. Such excitement costs $550 for one day, $975 for two, with instructors who include current and former champions. Book well in advance, and arrange for spa treatments afterward. You will have earned them." Finding a Racetrack...Cars that is.. Stumbled upon this site somehow, I can't remember how. Anyways, I think Jeff and I will have to keep track of all the tracks that we've visited or had the pleasure of actually driving on. At the end of the month we'll be venturing with TracQuest to Thunderhill. It's been a long time since we've been to a track and Jeff just completed his 30K service and upgraded the car with some mods that will hopfully improve the car's performance on the track. I haven't noticed any differences to the ride. While the Race Track Locator UI needs some improvements, I am impressed by the facets for how one could find a track. I think I spent a few hours just browsing for tracks. Maybe I can lend my services to help design the locator. If you have a 993 and you like to do car maintenance and projects, you have to check out Jeff Chan's* 993 FAQ site. Ok. Christina has convinced me about something I've been thinking about for a few years now...it's time to really check out convertibles. The passion she described in driving her new car around made me relive the rush I felt driving Jeff's porsche during auto-cross, but perhaps I'll check out some used cabrio porsches. I've heard the prices are coming down. Or maybe I can cruise along with a used miata, z3, or sl500. Oh what joy to have a convertible and the weather is so nice these coming few days. Saturday attended the PCA-LPR auto-cross event. Met some new folks and their cool cars. Malibu Grand Prix Took a few spins around the track and had a ton of fun. Will more than likely hit the course again soon. Waiting to hear back about our car...can't wait to take out for Auto Cross again soon! What does high speed cars and an IA have in common?